Image source: DIY Wedding Favor Tags. In studying the antiquated courtship and marriage customs and beliefs of the different towns and cities of the Province of Batangas, one can either be struck by how familiar they sound even in contemporary times or how totally peculiar they seem. Customs and traditions that were said to be observed in one town might also be mentioned with slight variations in others. That said, there were others that have become totally forgotten in the context of contemporary times and, therefore, seem unusual. The same may be said of the old courtship and marriage traditions in the small municipality of Taysan. From the so-called “historical data1” of the town1, we obtain olden traditions about courtship and marriage that used to be observed by inhabitants of the town. 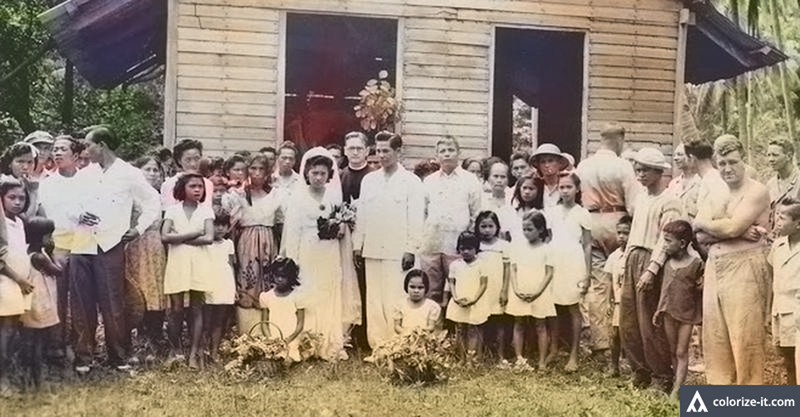 Most will sound familiar to regular readers of Batangas History; but there will be others, like the “sabugan” (literally, scattering) wedding tradition, that will be somewhat different from those observed in other towns2. When both the woman and her parents found the suitor acceptable, before they could be married, both sets of parents sat down to discuss the “bigay kaya” or the “amount of dowry that the bridegroom should give to the young woman’s parents.” This custom of the groom paying an expected amount to the parents of the woman was also observed in other towns of Batangas and probably other provinces as well. It has to be pointed out that the author’s use of the word dowry was erroneous, dowry technically being the “wealth transferred from the bride’s family to the groom or his family4.” The “bigay kaya” custom was, to be more precise, called the bride price or property, money or gifts which went the opposite direction5. In Taysan in the olden days, or so the source document said, the wedding could be simple or elaborate, depending on whether the families were “poor” or “well-to-do.” It was “usually performed in the bridegroom’s house.” This is a curious claim because according to the historian Manuel Sastron, Taysan had a church and a priest from the Order of the Recollects late in the 19th century6. 1 “Historical Data” refers to documents required of Department of Education Districts around the country in 1951 by the administration of then-President Elpidio Quirino to reconstruct local histories destroyed during the war. 2 Most of the information contained in this article is taken from the “Historical Data of the Municipality of Taysan,” online at the National Library of the Philippines Digital Collections. 3 The phrase “man’s work” as used by the author in the source document was ambiguous. It was possible he meant that the suitor was expected to do the work of the father or any type of work that a man would be expected to accomplish within any household. 6 “Filipinas: Pequeños Estudiosy Batangas y Su Provincia,” published 1895 by Manuel Sastron. 7 “Search Query: Dapitan,” online at TagalogTranslate.com.